The most important step in life is the first step or initiative that we take. There are many people in this world, who find it difficult to achieve their dreams but the trouble is that they are not willing to work hard. Realizing your potential is important! What if a person genuinely begins from the scratch? Why do we think about the outcome first? Why do we make up our minds that our life will never improve? Let us give you an ideal example of how we should not think about the outcome before starting! When we plan a trip from Delhi to Goa, we do not reach there in minutes! In order to reach Goa, we plan the trip, book flight/train tickets, wait for the day to board the plane, sit in the plane and then we reach the destination. Making a beginning is what truly counts! It is a slow process! In order to reach the destination, we need patience and we also need to start small. There is no shortcut in life. When we look at inspiring personalities around us, we get inspired but we are not willing to work as hard! The legend, Oprah Winfrey, is one of the finest examples of how an individual can shine in multiple ways. She does not come from a rich family and faced endless tragedies as a child. If Oprah Winfrey would’ve lost hope, she would not reach where she is! The power is in your hands! The power to change your life for good and if we do not begin, we would never be able to reach where we want to be! At the age of 32, the most popular host became a millionaire. This did not happen due to a miracle! It happened because she worked hard and started from scratch! One has to stop saying, ‘I wish I was as successful and rich as her’! How about saying, ‘I will do it!’? We look at others and their successful life. Why don’t we get inspired by looking at the success of people? We think to ourselves, ‘Wow! I wish I was so lucky!’ Human beings have the tendency to be dissatisfied with whatever they have. Why don’t we look at other people and get inspired? How can a human being achieve success? It is when we start believing in ourselves and not become insecure of others success. Do note that nothing is served on a platter. The successful people around you have worked hard to reach where they are. The bestselling author, J.K. Rowling, is one of the wealthiest women in the world. She had a difficult family life where her mother was suffering from multiple sclerosis. If you notice the tone of writing, you would find that most of her books are about death. There are many other inspiring stories which will awaken your soul and you would get inspired. We are sure that they had a rough beginning but it was their will power that helped them to achieve success. The trouble with human beings is that they think about the outcome. We have become calculative and we measure everything on the basis of whether we will be successful or not! Realizing your potential is the start of the journey and then success follows once you give your heart, soul and full dedication. As we come to the end of the post, we would like to conclude with the thoughts that nothing comes easy in this life. You might find something difficult right now but once you make a beginning and start doing it, you will find that it was not that difficult to achieve! Nothing is impossible! In fact, if one separates the word IMPOSSIBLE, you would get IM-POSSIBLE! Nothing is impossible in this world till you give up. The key is to never give up. Whether it is a Mathematics sum, an art work or an ambition, you must start practicing or work towards it. If a builder never started with a design, he would never be able to make the building. When you seek for jobs and go for the first job interview, you might get rejected. We see many people giving up after that because rejection is something we do not take very well! You might get the job but it might not pay you a fortune. 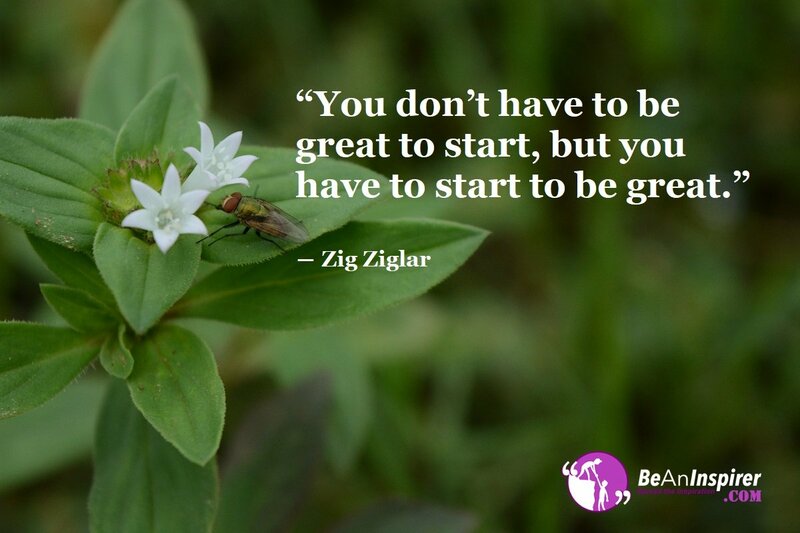 The key is to start and with little steps and patience, you would reach your actual goal! Bid adieu to the tendency to be dissatisfied and learn to wait and work hard towards your goal. Even when people disappoint you and tell you that you cannot do it, you have to ignore all the negative talks and believe in yourself. In a nutshell, make a beginning and we are sure that you can achieve anything in life! You do not have to be extraordinary or great to reach somewhere in life. With small steps, low expectations and big dreams, you must patiently walk towards your goal. You want to have a successful life? Work for it!